Photo of the Week.. 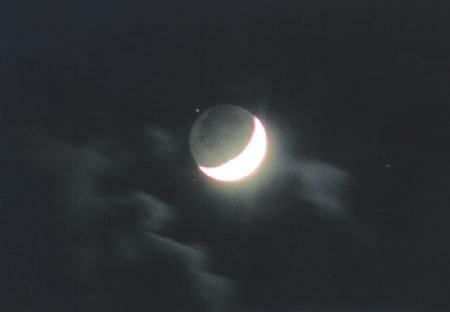 The crescent Moon takes a bead on Eta Geminorum, ready to pass over, or occult it. Astronomy news for the short week starting Sunday, January 13, 2002. The Moon passes between the Earth and the Sun in its new phase on Sunday, January 13, and all we can see is the dark nighttime side. By the night of Monday, the 14th, the slim lunar crescent will be visible in evening twilight, its nighttime side lit with light reflected from the Earth. If you were on the Moon, you would see an almost-full Earth. Given that the Earth is both four times the size of the Moon and that it is much more reflective, the night on the Moon under full-Earth is 80 times brighter than the earthly night under the full Moon. That same night, the 14th, the Moon will lie 4 or so degrees south of the planet Mercury and might help guide your eye to the little planet closest to the Sun. The SECOND planet out, Venus, has been invisible for some time now, as it makes its circuit around the other side of the Sun. On Monday the 14th -- a busy day -- Venus passes through superior conjunction, the Earth, Sun, and Venus more or less lined up in that order and Venus at her greatest distance from us (some 255 million kilometers, 160 million miles). Venus will then slowly begin to clear the Sun as it prepares for evening visibility. By March, Venus may be seen setting in mid-evening twilight, and this coming summer will make a glorious evening spectacle of itself. With Mars still in the southwestern sky, Jupiter (beautifully set in Gemini) passes the celestial meridian just before midnight and nearly overhead in northern climes. Saturn, close to the Hyades in Taurus, beats Jupiter to this north-south line, crossing the meridian around 9:30 PM. Still in retrograde, Saturn will get even closer to this vee-shaped cluster, the Hyades and the planet presenting a very attractive sight by the end of the month. The winter stars are now in full array. Look high in the sky around 8 PM to find the compact cluster of the Pleiades. Compact it may seem, but it is still so spread out that the telescope does not show it all that well -- best to use binoculars. With either, hundreds of the Seven Sisters' cousins will pop out for you. Vast numbers of clusters dot the sky. Look to the central star of Orion's sword and admire the famed Orion Nebula. Within it is one of the sky's richest star clusters, topped by the 4-star "Trapezium" that lights the nebula, most of the clusters stars lost to the nebular glow. The Orion Nebula is a blister on the front edge of a vast dark molecular cloud in which star formation is going on even as we watch.